Last year I shared Crystal’s life experiences that helped us understand her early life and young adulthood approaching her Saturn return. 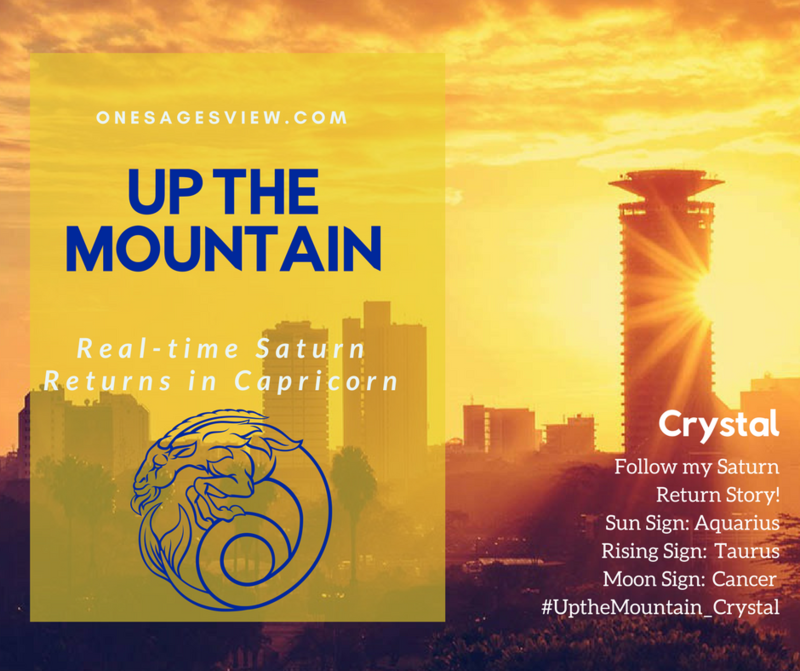 In Part Two for Crystal, we will be exploring some of the more meaningful experiences that highlight her Saturn return while Saturn is transiting Capricorn. If you want to read Crystal’s Part One story in this blog series, you will find it here. Career success, which includes higher education and achieving some breakthroughs in personal achievement is a central theme in Crystal’s life. Her Capricorn stellium (cardinal earth) is trine her Ascendant and Jupiter in Taurus (fixed earth). Working on something that may take steady progress (Taurus), a significant amount of time (Capricorn), and hard work (Taurus and Capricorn) are the ingredients for her evolution. In our conversation around February 21, 2019 to discuss potential themes related to her Saturn return and what themes were highlighted in her Solar Return for the coming year, I learned about her life experiences that were manifested in 2018. Indeed, we will see the archetypes of both signs (Capricorn and Aquarius – her 9th and 10th houses) and why her experiences included traveling a great distance, higher learning, and developing her professional life as well. The most obvious event for Crystal in 2018 was her decision to begin a technical and business training course that takes a year, which was a special program held in Ghana, on the western coast of Africa. To explore this event with astrology, it would be good to review the time her flight took off for Ghana. Crystal’s flight to Ghana departed Nairobi on August 9th, 2018 at 8:30 am (BAT) with a flight time of just under six hours. The universe showed her something unique on her very first day of travel in meeting a significant person at the airport. She met a man who was also traveling to attend the same program in Ghana. It turned out they were born within hours of each other, a near birthday twin! He was born January 20, 1989. She was amazed to learn about their similar life experiences in getting to know her new friend, who she noted is a determined Capricorn like herself. Crystal immediately felt a kinship with him and they became friends. As time went by her friend became a source of comfort in this new country and unfamiliar place. They became close friends in the time she was there. Crystal’s accommodations in Ghana had no window and no breeze and was quite hot. She experienced some bullying there as well, and her ability to focus was increasingly challenged. She felt so constrained that she started to feel sick in the month of September. With these challenges Crystal decided to return home on September 30th. Looking at the transit chart for the time her flight left Nairobi for Ghana, we can see a few challenges that would have been significant in her leaving the program earlier than she had planned. Squares and oppositions are the challenging aspects to consider when reviewing the difficulties of a time period, but conjunctions are also important, depending on the planet and what houses are involved. For deeper insight of Crystal’s experience, we look at the timing of her leaving home for this event. Crystal faced multiple challenges on the day she left for Ghana. I will list the astrological transits and aspects between planets on the day she travelled and relating to her natal chart and then discuss each briefly. Transiting Saturn in Capricorn retrograde applying to another conjunction with Uranus in Capricorn approximately 14 minutes of arc from exact. Transiting Venus at 2 Libra 16 minutes (rulers of 1st and 6th house) is applying a square to her natal Uranus Capricorn at 2 degrees 56 minutes (with Saturn transiting to conjunct natal Uranus as noted above). Transiting Mars in Aquarius (with transit of lunar south node at 5 degrees Aquarius) square to natal Mars in Taurus (within 24 minutes of arc to exact). Transiting Mars retrograde in Aquarius separating from a conjunction with her Sun. Transiting Pluto in Capricorn retrograde opposite moon in Cancer wide orb by 7 degrees. Ruler of her Ascendant Venus in transit is square natal Uranus in Capricorn (and square to Saturn transiting her natal Uranus). Transiting Saturn in Capricorn retrograde and applying to another conjunction with her natal Uranus in Capricorn shows the merging of Saturn in Uranus in the sign that is about structure, traditional values, self-control and achievement. Uranus is the key to the instability of the goal and her intention. Saturn coming to meet Uranus again will certainly contain an unexpected outcome, not what she is intends and will feel like it came out of the blue. The determinism that Saturn in Capricorn would otherwise be trusted for achievement will not hold due to unforeseen interruption of some sort and emotional security concerns. Capricorn is also cardinal and is an energy known for stops and starts and fast changes. Transiting Saturn in the 8th house shows us Crystal’s emotional sensitivity to her environment (security) that she did not see ahead of time (8th house is not visible to the 1st house of self) and that indeed took an unexpected turn in her plans related to her place of residence in Ghana. Transiting Venus is applying to a square (challenge/tension) with her natal Uranus in Capricorn and a square to Chiron, essentially setting the ruler of her Ascendant (Taurus). The 1st house is also the body’s vitality of a person. Her 6th house (Libra) is where we may find issues related to lack of health, since 6th house is also not visible to the vitality of the 1st house. The ruler (Venus) is the T-square between Uranus (sudden events or changing dynamics are symbolic of the unexpected illness she experienced) and Chiron (wounded healer/original wound) in Cancer which hints at her inner self-security being disturbed by the tensions of her environment. When an aspect is applying to be exact it has more intensity until it is exact and then it begins to wane as it separates. Transiting Venus is applying to both Uranus and Chiron in the moment Crystal leaves for Ghana. She is unaware that her health and vitality as well as potential for illness are higher probabilities with this T-square perfecting in the chart on such an important planet (Venus) for her overall well-being. Mars is significant for Crystal, as we see in her natal chart, because the planet is square to her Sun in Aquarius. Her natal Mars is also located in her 12th house, a house known for suffering and being isolated away from others (sometimes through hospitals or prison) and yet growing spiritually with ties to the mystical experiences of life, the unconscious mind and the collective. Mars, in traditional astrology, is the planet to watch closely for her more challenging moments, as she is born during the day (known as a diurnal chart). If she was born at night with the Sun below the horizon Saturn would be the greater challenge in transits and cycles. With a hint of traditional astrology, knowing the symbolism of Mars squaring natal Mars is an aspect of concern and should get her attention for potential issues. However, transiting Mars really had even more challenging energy behind it in the moment she flew to Ghana, because transiting Mars had just separated from the South Node of the moon retrograde and it also squared transiting Uranus that had recently entered and moved retrograde in Taurus. Having only stationed retrograde two days prior to her flight, Uranus was barely moving in the sky and would have increased the volatility of its nature of the moment. Notice the extra instability with transiting Uranus conjunct her natal Mars in this very moment! Mars here is a highly unstable energy connected to her planet of free will and action. She would unexpectedly have doubt about making the trip within a short time of her arriving in Ghana. Squares by their nature are also likened to Mars, tension filled and disruptive, sometimes so much so an individual will often have to make a hard decision and choose again. Robert Hand notes in Planets in Transit that Mars transit conjunct Sun, “has tremendous potentials and definite risks. You will have to be careful in everything you do, because the high energy of this transit can have explosive consequences.”[ii] Mars squaring natal Mars suggests being instinctually impulsive, one might say having a short fuse. In the fixed signs of Taurus and Aquarius Mars may be more restless in nature, but the added elements of transiting Mars out of bounds and transiting Uranus conjunct natal Mars indicates there is a heightened unexpected impulse to be free and unconstrained that would dominate the individual’s state of mind. Transiting Uranus in Crystal’s 12th house and conjunct her natal Mars would also be a potential for upset and unconscious compulsive behavior. Because Uranus by transit is stimulating her unconscious mind and her natal Mars impulse for action, we observe in this experience one of the highest probabilities of instability and discomfort that moves her to decide to leave before she has completed the training. When Jupiter made an applying conjunction to Crystal’s natal Pluto in Scorpio, in the moment she flew to Ghana, the combination would have given her an intensification around her feeling nature at the “gut level”, root chakra level as well as sensitivity to unseen energy and toxic people that would hinder her feeling balanced and healthy. Jupiter expands what it connects with, and in this case Pluto in its own sign of Scorpio. This aspect of Jupiter in Scorpio conjunct her natal Pluto would be like Pluto coming above ground as Howard Sasportas outlines above regarding the understanding of Pluto in the 6th natal placement. The potential for unconscious wounds to surface and reveal in her body would have likely been noticeable in the days when she first arrived in Ghana. Sometimes fear or not knowing consciously where the fear comes from can make us ill when we don’t have a way to ground ourselves and shake it off and find our center again to move with purpose. And sometimes our instincts and our intuition give us a warning, a shot over the bow, and our job is to heed it and make a move to safety. We do not fully know the depth of Crystal’s mind, heart and soul on this matter objectively; we only know about her feeling nature and impulse to change her mind and make a new decision. Maybe there is more to offer us in her astrology of the time she arrived in Ghana and the time she left to answer with more certainty if her instincts were guiding her to a better outcome. An additional aspect of her flying to Ghana was the grand water trine in the sky at that moment. Transiting Jupiter in Scorpio at 14 degrees 37 minutes is trine to the moon in Cancer at 15 degrees 43 minutes and powerful Neptune is at 15 degrees 50 minutes of its own sign of Pisces. Crystal’s own moon in Cancer at 26 degrees would have connected through the transiting moon to this superb watery flow, offering her emotional information on an open inner highway. With Crystal’s moon perched on the 3rd house cusp (using Porphyry) her Moon in Cancer tells us she will have an extra-sensory shield for protection in her surrounding environment (the immediate environment is a 3rd house matter). If ever the environment is radically out of balance for her, it can have a strong destabilizing affect on her mental and body health. The grand trine water of that moment was her life-preserver in the unfolding few weeks ahead of her in Ghana. The heavy dose of the water element in the transiting grand trine clearly signaled to her that the environment was constricting her so much that she had to retreat to return to balance. Astrologer and author Sue Tompkins states, “The talent of the watery trine lies in the fact that the individual is able to be immediately in touch with what they feel about something.”[iv] Crystal’s natal Chiron also in Cancer (also opposite transiting Saturn in Capricorn and her natal Uranus) would also be indicative of her sensitivity about her safety. With the bullying she experienced, in addition to her residence that was without proper air flow or windows, her needs for safety and general environmental sensitivity were not met. 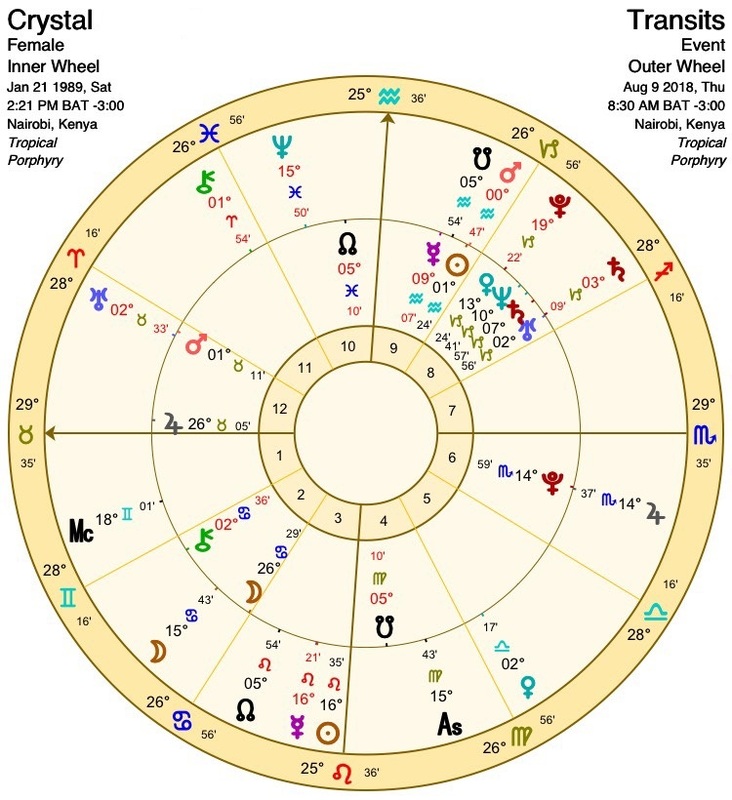 Unexpected, to be sure, but with the transits in this event chart for the beginning of this learning adventure, things were amiss on many levels and were not going to go the way she’d planned or hoped. Considering these influences, Mercury’s motion, inferior conjunction, and importance related to 9th house matters (natal Mercury is in Crystal’s 9th house), we can glean deeper insight into the importance of her gut-level messages and deep feelings that she received while in Ghana. Transiting Mercury was also inconjunct (an aspect of tension and disconnect) to her natal Venus, which is her ruling planet (Ascendant) of her 1st and 6th houses, which is important for her vitality and well-being. In reviewing the event chart for Crystal and the important highlighted aspects, we gain clarity on the many challenges that unfolded in her distance learning experience in Ghana. This chart review may help her feel some resolve for making a sound decision, given all the moving dynamic parts of the moment, and will help her check the box for self-awareness on many lessons learned from the experience. She truly has matured in the overall experience. After returning home she let go of the idea of forcing her will on matters. She’s not yet returned to her finance job in solar energy, but she has recently begun a small personal technology project and has found a technical savvy business partner to work with on the project. When I asked her what was her most significant learning of 2018, she thoughtfully stated, “This past year I learned to relax. You know, I had so many expectations of life and they hit you hard, I guess. Thirty just comes with this extra pressure, and I just told myself to relax.” Later in our conversation she shared that she came to understand her ego and the ways she’d been limiting herself. One major lesson she learned is that life is not about what she likes but is also about being used by the divine. She came to understand the attachment of her ego and to relax, since she doesn’t know everything, and that lesson came through clearly and softened the grip on her desires. She also learned that just because she wants something, the desires, she has to enable herself to achieve things that she is dreaming about. She had left too much to chance in dreaming about her desires without a practical approach and that she has come back to earth to achieve success. Truly, in hearing Crystal share her growth it was clear that Saturn was significant in her maturing and her next steps in moving towards that which is inspired within her to bring to her life. With one more look into Crystal’s astrology of 2018, I wanted to see what was to be seen in her secondary progressed chart. I decided to run the secondary progressed chart for September 30, 2018, the moment she landed back in Nairobi. When you review the chart, immediately the secondary progressed moon jumps right out at you in her fourth house of home and family, just passing her chart nadir angle. This illuminated that even though her hopes had changed dramatically based on unforeseen events and experiences, being home was exactly in alignment with the cosmos of her inner world. Crystal was exactly where she needed to be at home and to do her next thing. 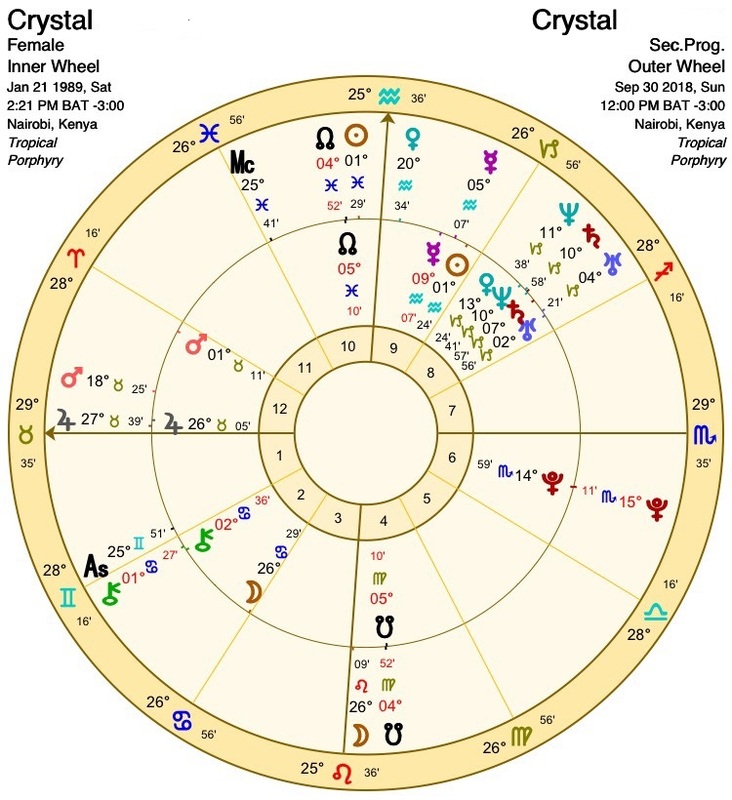 This is not easily seen in the transit chart or in her conscious awareness of that moment, but her secondary progressed moon moving into her 4th house is a very clear statement of her mystical dance with the cosmic cycles within her nativity. She landed exactly where life wanted her to be and to flow. This insight hopefully will yield a new level of trust in making hard decisions for herself and to secure what is right for her environment to do her best work. Her gut feelings and decision to return home will bloom into something she may not have expected or planned, which also goes well with her Uranian overtones of her natal Sun and Mercury in Aquarius. Looking ahead for Crystal from her birthday in January this year (2019) through to her next year (January 21, 2020) there are a few transits of significance that will be a part of her development and maturity as Saturn has moved past her Capricorn stellium, but will oppose her moon after the transiting Pluto. Additionally, the south node will move to a conjunction and oppose it. These three transits opposing her moon in Cancer will be a paradigm shift, first South Node, then Pluto, and then Saturn and with an opposition, it will be a forcing her to a significant decision. Working in isolation may be part of this shift. These themes include her need for a positive work environment, and shared resources and responsibilities for a business relationship. Working from home is part of the mix (we see this presently), as the Ascendant of her Solar Return (last year) shows that theme as a focused area which landed her back home. Is this a year she finds an environment beyond home that she will work within collaboratively to grow professionally? Or is it work at home to launch something when it is right? The latter seems most likely. Crystal feels that her growth comes from better understanding her work in isolation and working to connect with other people. She has few but strong relationships but sees the limits when trying to do business. The growth area she identified this year will be in her social skills and in learning to be more vulnerable and less uptight, which also will help connect her with others. She also sees growth in her work discipline and work ethic to achieve what she intends. Her growth insights are quite Capricorn. [i] Arroyo, S. and Marshall, J. (1989). Stephen Arroyo’s chart interpretation handbook. Sebastopol, Calif., U.S.A.: CRCS Publications, p.115. [ii] Hand, R. (1976). Planets in transit. Gloucester, MA: Para Research Inc., p.226. [iii] Sasportas, H. and Greene, L. (2007). The twelve houses. London [England]: Flare Publications, p.247. [iv] Tompkins, S. (2002). Aspects in Astrology. Rochester: Inner Traditions International, Limited, p.89. [v] Gray Crawford. (2019). Mercury Retrograde in Leo. [online] Available at: https://graycrawford.net/2018/07/30/mercury-retrograde-in-leo/ [Accessed 14 Mar. 2019].